GM is currently working on the new-generation Chevrolet Silverado and GMC Sierra HD trucks. Both vehicles have been spotted camouflaged recently, and we’ve explained what’s going to happen in near future. 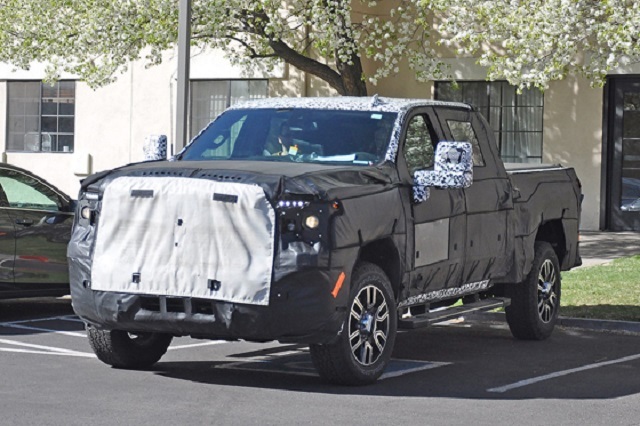 Today, our photographers have managed to catch one more testing model that appears to be the 2020 GMC Sierra Denali 2500 HD. The upscale pickup truck was totally wrapped around, so it is not easy to conclude what’s hidden underneath. Still, there are a few details that give away the new-generation pickup truck. The 2020 GMC Sierra Denali 2500 HD will just like the regular new-gen Sierra truck ride on a new platform. The new chassis includes plenty of aluminum and high-quality steel which will definitely have a positive influence on pickup’s curb weight. More precisely, the latest reports claim that the heavy duty truck is going to lose at least 400 pounds. Aside it’s going to be lighter, the new-gen Sierra Denali 2500 HD should be slightly larger from the predecessor. Styling-wise, well, as far as we can see, the vehicle rides on new and shiny 20-inch wheels. There’s a lot of chrome I the front, especially in the grille. The grille also seems to be larger than before, but let’s wait to see the final version. Below the camo hides a big and slightly pronounced which will have big air intakes without any doubt. The airflow is highly important because the 2020 Sierra Denali 2500 HD will be offered with two pretty large engines. The Duramax 6.6-liter V8 diesel and the 6.0-liter gasoline V8 units are quite familiar already, but they will not be completely the same as earlier. The Duramax will definitely be improved in order to deliver more horsepower and grunt, which will have a positive influence on hauling abilities of the truck. In addition, the engines will keep a six-speed auto as base gearbox, but the potential buyers will also be able to get the optional Allison 1000 six-speed automatic transmission. Moreover, GMC will even reconsider to add the new Hydra-Matic 10-speed automatic transmission. The luxury version of the new-gen Sierra 2500 HD will be introduced early next year. If the carmaker somehow misses the chance to introduce the truck as the 2019 Detroit Auto Show, the official arrival will happen shortly after than in Windy City. 2018 Dodge Dakota: Will the rumors come true? 2019 Ford Ranger Raptor Spied in Australia: What's that under the hood?